Welcome to Setting for Four! 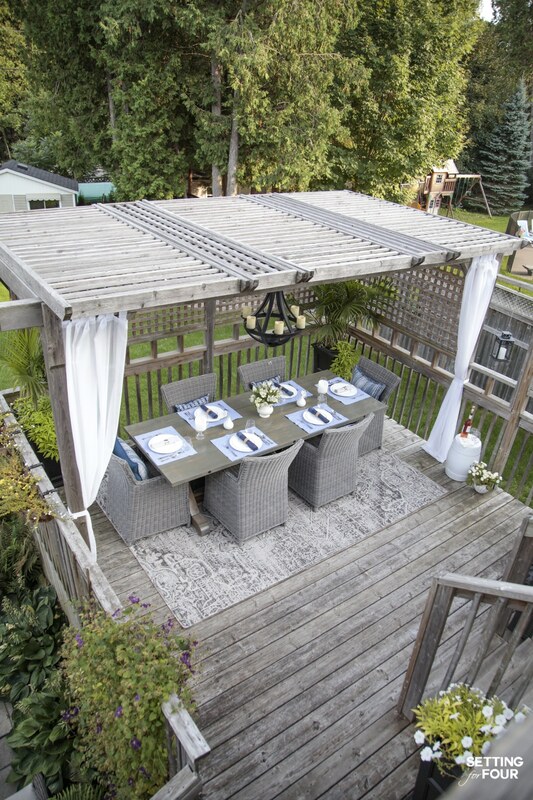 See this outdoor living decor lesson and learn how to create a beautiful pergola dining area! In this post you’ll learn the design elements that go into it so you can create a look that matches your style. 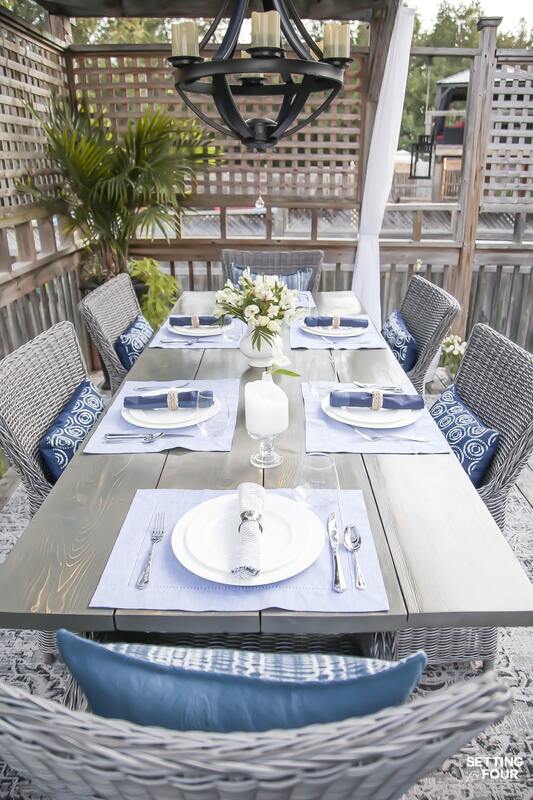 If you’re stumped on how to create a relaxing outdoor dining are then this is for you! I’m also sharing all the details on our dining furniture, area rug, lighting, table setting and decorating selections. 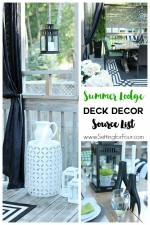 Shop my pergola dining area! Click on the images below to see more info and shop the look! Our pergola was built by the previous owners. We LOVE it!! It’s the first time we’ve owned a pergola and it’s so fun to use! If you have space for one on your deck or patio I highly recommend adding one. Note: Our pergola is not stained it has naturally weathered this gorgeous gray from the elements – isn’t it pretty? If you don’t have a pergola you can buy ready made pergola kits like this beautiful white one or this gorgeous gray wood one! The fun thing about a pergola is that you can hang beautiful drapes to create an outdoor room! I just love looking outside and seeing them! They are simple, inexpensive white semi sheers like these and they hold up really well to the rain and sun. They are tab topped and slide really easily open and closed on my quick and easy 10 minute DIY outdoor drapery rods! You could also use outdoor grommet style drapes like these too. My hubby and I made this Restoration Hardware lookalike trestle table for only $157, including the wood and all supplies!! Whhaaattt??!! Yes, that’s right! We made it and the free plans to build it are here. We get so many compliments on it! I stained it a gorgeous weathered gray on top and a lighter gray on the bottom – the stain colors and technique are listed here. 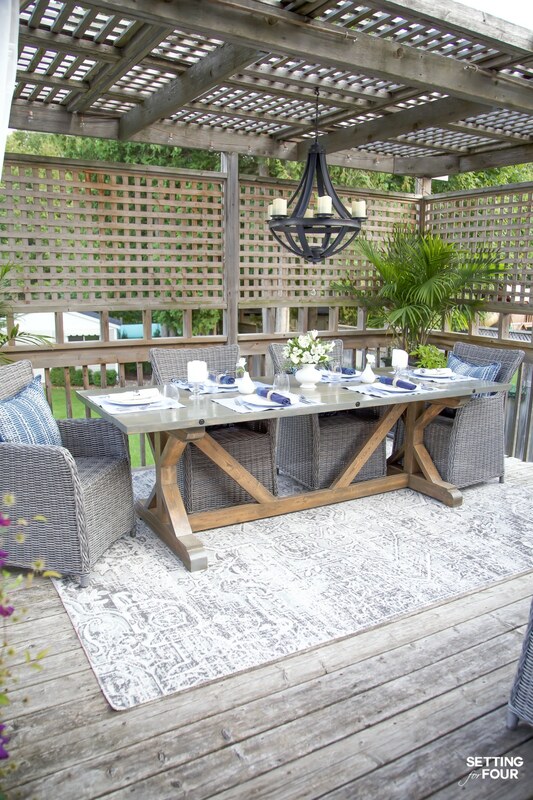 It’s so beautiful, love how the gray compliments the deck color and our wicker chair color…. and I love that we made it for so little money! In the winter we simply cover the table up with an outdoor table cover and it’s survived very cold temperatures and snow storms without any problem! I highly recommend outdoor resin wicker dining chairs. They add so much beautiful texture to your dining table and are really comfortable to sit in – no sharp edges and have a nice smooth feel. Plus they are so durable in the sun and rain and dry really quickly when they get wet. I am a firm believer in getting chairs that are don’t sacrifice comfort for style! We love to entertain and I don’t want myself or my friends and family feel uncomfortable at our table! You can purchase gray wicker dining chairs like ours here and here. 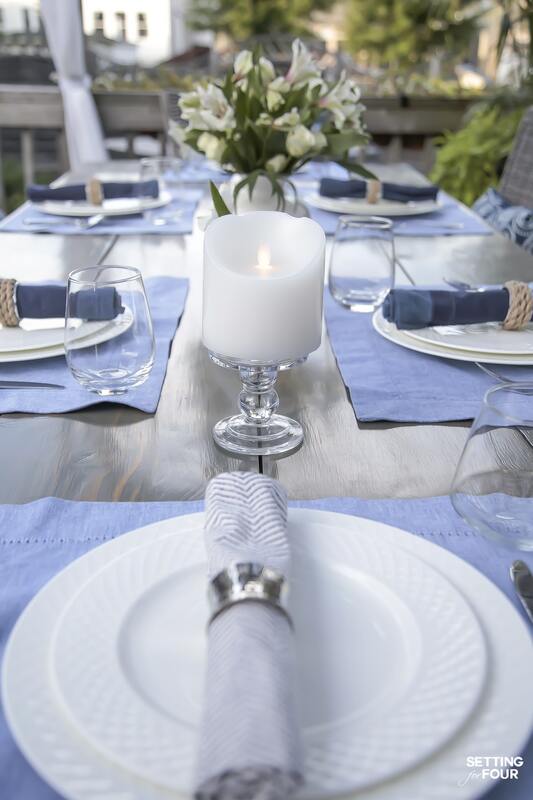 Choose an accent color for your outdoor dining space and repeat it at least 3 times in separate areas of your dining space to create unity and flow. I chose blue. There is blue in my rug, blue pillows on the chairs and blue napkins on the table. Choose an accent color that you love! Do you love green, plum or orange? Pick your favorite color and let it dance throughout your space! Choose an area rug that is big enough for your table and chairs. That means that the chairs legs should still be on the area rug when you pull them out to sit in them. You can calculate the correct measurement with this free guide here. Thank you to my friends at Home Dynamix for sending this stunning indoor/outdoor area rug to me! It’s from the Nicole Miller Collection (I absolutely love Nicole Miller decor – do you?). 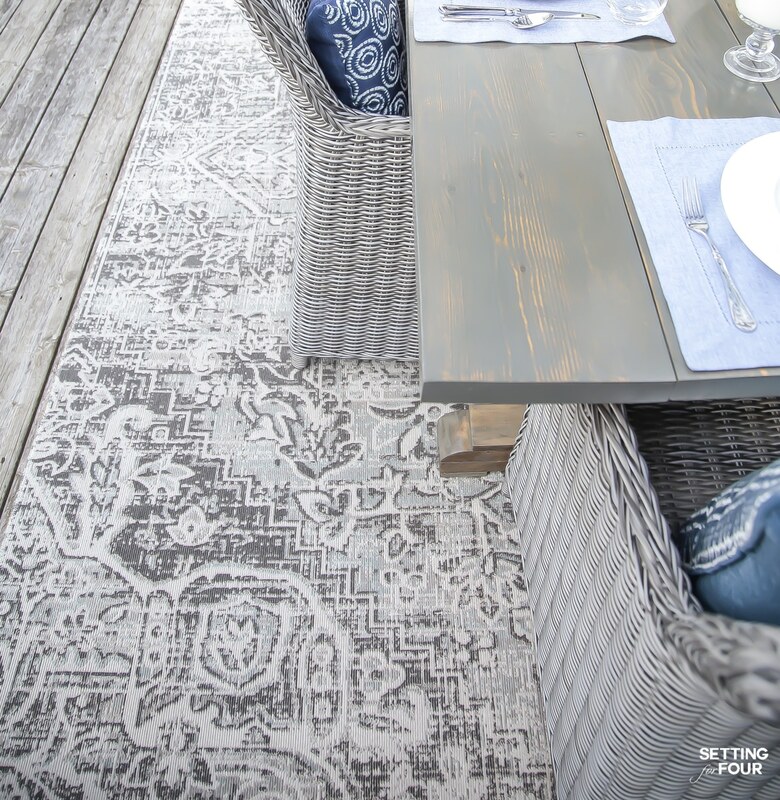 This gorgeous Patio Sofia by Nicole Miller Collection rug that I chose is a beautiful gray, cream, and light blue color and a classic distressed medallion pattern and the texture is amazing! This rug is sooo soft and lush! Even my husband asked me if it really was an outdoor rug because it looks and feels like an indoor rug! But it is an outdoor rug! I wouldn’t hesitate to put this in any room in my home. Check out Home Dynamix for gorgeous rug patterns for your home! You know I’m obsessed with pillows! Pick a pillow color that contrasts with your table color and rug color for a lively pop of interest like I did here! Pick pillow patterns that speak to you and you’ll use them year after year stretching your decorating dollars. Trellis patterns, stripes, florals, tropical prints and global style prints like Moroccan and shibori will always look fabulous. I added beautiful indigo blue shibori print pillows like these and black pillows to our chairs for extra comfort to our chairs and to introduce pattern and color. If you love green or orange or plum – go for it! Using bolder colors outside is easier than using them inside in my opinion. OR you can use pillows in monochromatic neutral hues of cream, beige or gray if you want a more relaxed, elegant look! Lighting is key! Outdoor lighting will add ambiance to your dining space and there are so many inexpensive ways to add lighting outdoors today! A pergola begs for a chandelier! Bring the indoors outside by hanging a battery operated chandelier like ours. It really just makes the space and adds a pretty glow at night to keep outdoor parties lingering long into the evening. Fairy lights and globe style string lights are an easy way to add an extra twinkle. I hung our string lights along the back of the pergola as a pretty backdrop to the space. These realistic dancing flame candles are my newest obsession!! Thank you to my friends at Mikasa for sending them to me. They look like REAL moving candle flames, but they are completely safe because they are battery operated! They also have timers (LOVE that!) and I set mine to automatically come on at dusk. Especially if you have kids and pets these dancing flame candles are a fabulous idea! Choose dishes in a color and pattern that you love and repeat the color on your table and around the space. For example my dishes are white and so are the drapes, garden stool, flower vases and candles. Designer Tip: Repeating colors will give a unified look to your space. You can never go wrong with classic white dishes! Thank you to my friends at Mikasa for sending me this stunning Trellis Dinnerware Pattern! I love the trellis patterned band on the plates and cups. Timeless and classic. These plates look gorgeous layered with other plate patterns too! Choose flatware that coordinates with your dinnerware. This French Countryside pattern is our everyday pattern. I love the beaded detail on it! Choose glassware that coordinates with your dinnerware. This is where you can have fun and use colored glassware that coordinates with your plates! I love these beautiful blue glasses! Stemless wine glasses are my go to glasses for a dinner party. These iced beverage glasses are our everyday glasses. Table linens add texture, pattern and color to a dining space. 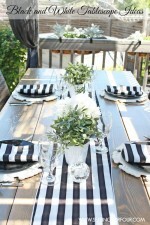 They are another layer to a beautifully set up outdoor dining area! Choose a napkin color and pattern that coordinates with your dishes and use a color as I described above in ‘Accent Color’. Make sure they coordinate with the overall feel of your dining table area and have fun with napkin fold ideas! I love to use two different chargers or placemats for my table settings to add interest. I typically add identical placemats on the ends of the table then add a different set of placemats or chargers in the middle seating. For this table setting I used one set of placemats for all place settings because I love them so much! 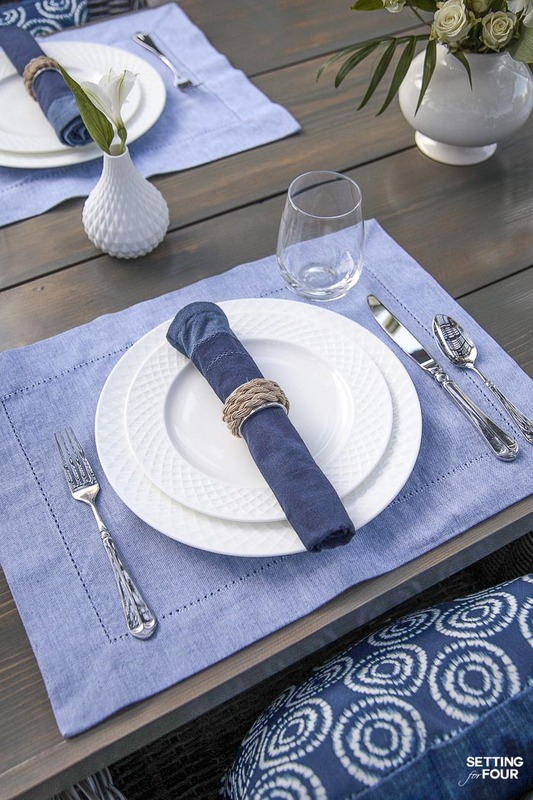 I used these gorgeous chambray placemats that I found here. 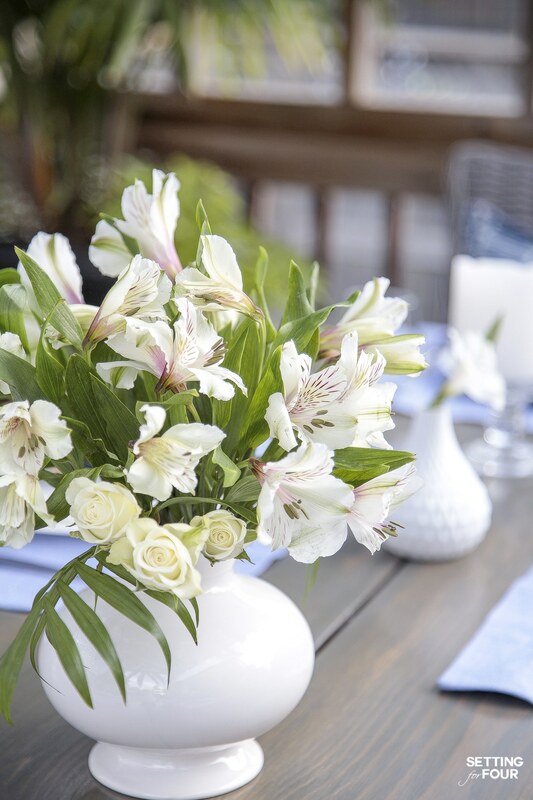 Add a bouquet of flowers as a centerpiece. I love to use one color for my floral arrangements like this one that uses white roses and white. I added a couple of small palm fronds to add a pop of green. If your accent color is orange, yellow or plum use flowers in this color to repeat your accent color again! I have a lot of napkin rings – to me they are the jewelry of the table. I love these rope styled ones – they fit so well with the outdoor vibe! 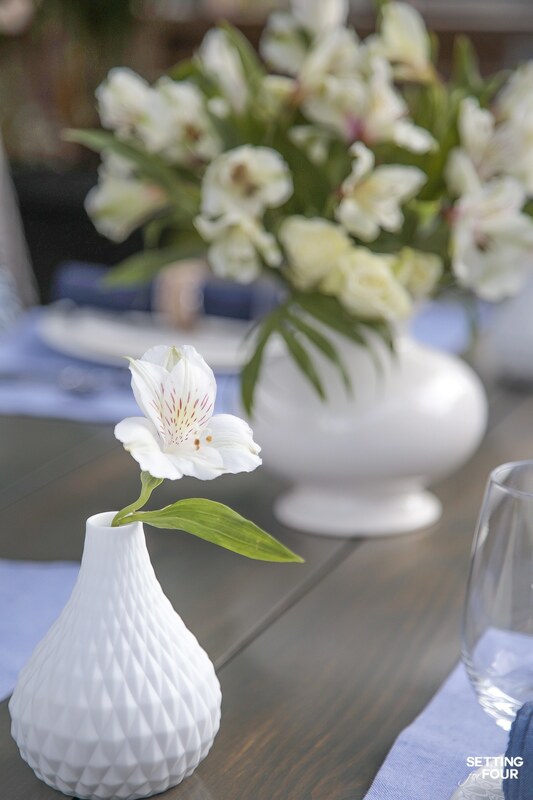 Use glass or ceramic vases for your flowers. I love white vases! I picked this white one up at the thrift store and love the shape. I added one on each end of the table because I think it’s nice for the people seated at the table ends to enjoy flowers too! Candle holders are a great way to add a metallic shine or another color! Or opt for glass pillar candles like I did for a subtle look with a bit of sparkle! I love these pillar candle holders with my dancing flame candles. Having planters filled with your favorite trees, plants and flowers will decorate your dining area and make it feel relaxing. I talked about all my no fail plant ideas for planters and containers here. I’m loving these palm tree mixed with flowers and potato vine planters! These tall black planters are my favorite – they add gorgeous height and have a false bottom so they don’t take a lot of soil to fill! 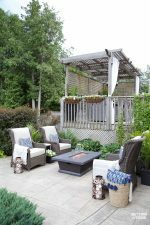 I hope you enjoyed this post on How to Create A Beautiful Pergola Dining Area – Furniture, Rug, Lighting, Table Setting & Decorating Ideas! 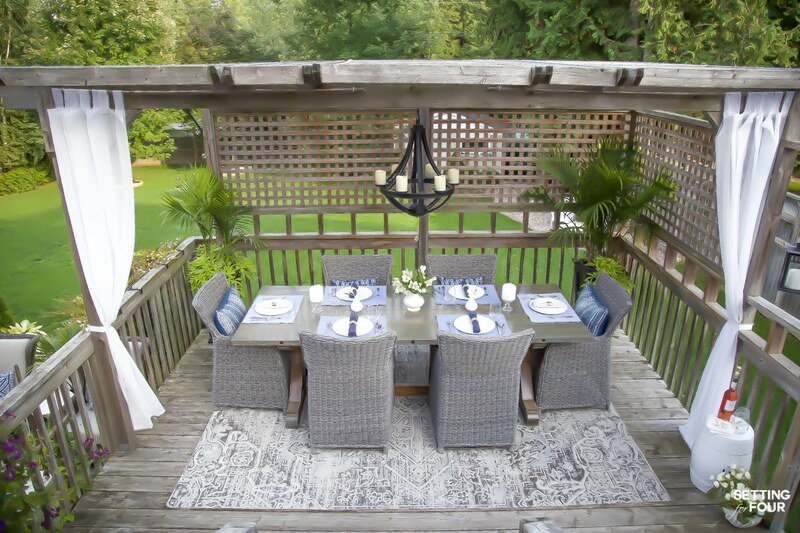 Did you see any ideas that you’d love to add to your outdoor dining space? Get FREE Decor Tips & DIY Home Inspiration! 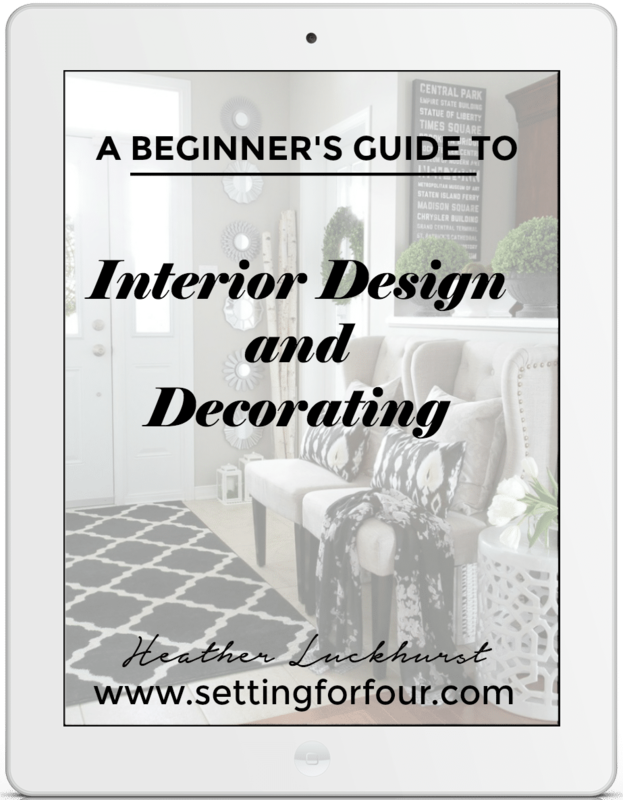 A BEGINNER'S GUIDE TO INTERIOR DESIGN AND DECORATING!! 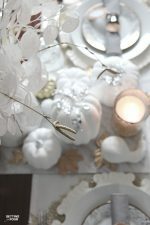 Budget Friendly Elegant Table For Thanksgiving – Decor Tips! 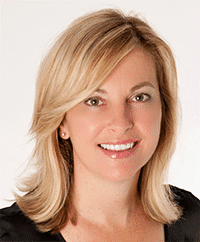 Heather Luckhurst is the publisher and owner of the Design and Lifestyle website settingforfour.com. Along with being a proud military wife and mom of two boys, she is also an Interior Decorator and digital media influencer. At Setting For Four, she shares creative design and decor ideas, stylish DIY projects, easy entertaining ideas and recipes. 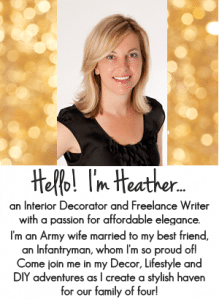 Heather is addicted to Instagramand casual, glamourous interiors. This is beautiful and so classy! Thank you so much Amy! I’m so glad you like our outdoor dining space! 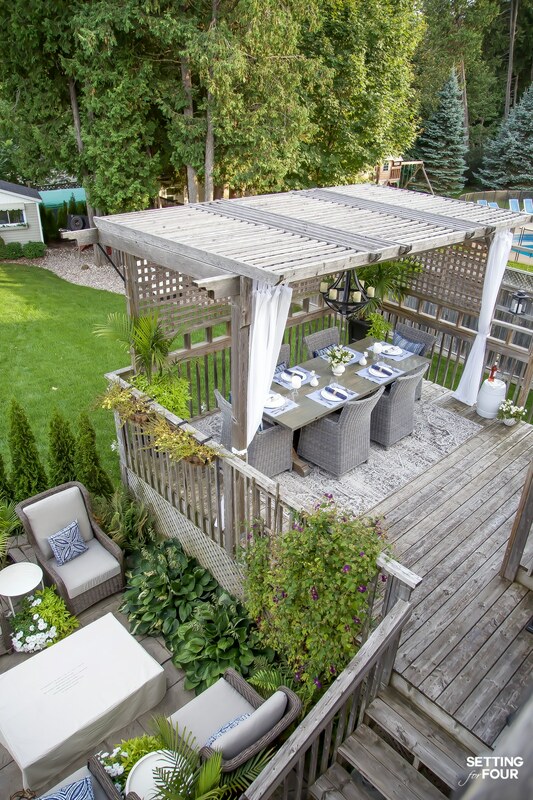 What a beautiful outdoor space Heather! Your outdoor space is beautiful, Heather! All of the touches you have added have taken it from ordinary to truly extraordinary. This is SO beautiful! Thanks for the inspiration! Pinning now.